I'm really bad at finishing projects before starting a new one. Like, extremely bad at it. I probably mention it in every post. I have so many projects sitting in my closet and draft blog posts that I keep telling myself I'm going to post "soon" (whatever that means). This is project is one of them. I remember when I saw a yarn sale at Michaels a few years ago and got so motivated to make something awesome and colorful with it all. Yes, I initially thought of this project years ago. The yarn sat in my closet for months until I finally decided to start something. 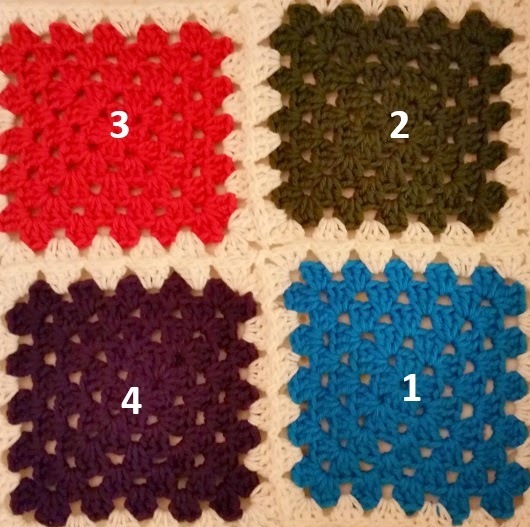 I made a few granny squares here and there, drafted the pattern, took tutorial pictures, and then more months went by. I finished the blanket but left it sitting in the living room for more months. Then today, I randomly decided to finish it and finally post the darn pattern. I love that feeling of accomplishment once everything is finished. "I love making blankets when the weather gets colder. Not only is it relaxing, it also keeps me warm while I'm working on it! This granny square blanket is simple, but very elegant, and would look great on any bed or couch. I love the vintage and comforting look of it. 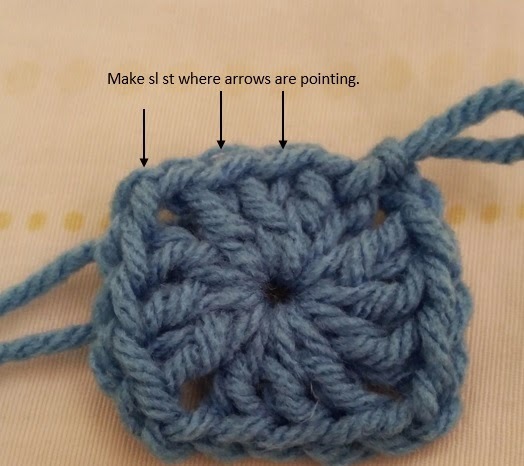 It's very simple, and works up fairly quickly for a blanket. The join-as-you-go method I used to join the squares also eliminates having a bunch of squares laying around and the pain of spending a bunch of time joining at the end. 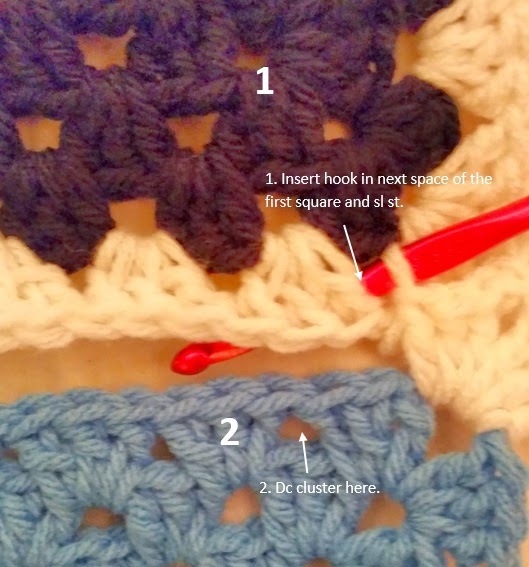 I like this method also because it makes the crocheting of the blanket more interesting. I like doing different things (different stitches, sewing, joining, etc.) while I'm crocheting a project, instead of doing the same stitch over and over again. This mixes it up, which may be good for some of you. If you prefer to do things all at once, you can definitely save up the squares and join them at the end. What's great about this type of pattern for a blanket is that you can make an infinite amount of color combinations depending on your preference. 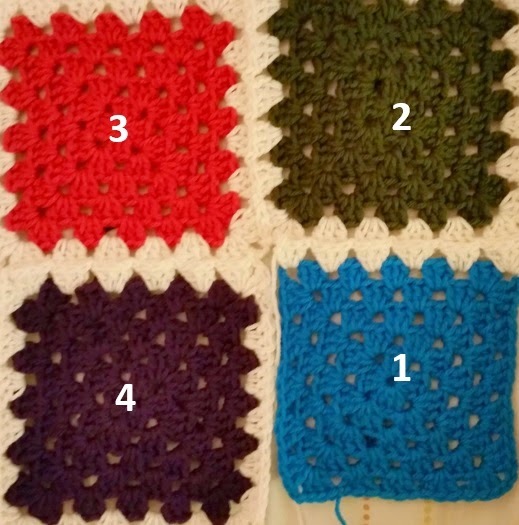 You can even make each square multicolored instead of just solid colors. With so many options, I think it'll be harder deciding which colors to use! It's very customizable in size too. Make it as small or large as you want simply by adding more or less squares." Definitely don't need it to keep me warm while making it in the middle of summer in California! The inspiration of completing projects gets reignited when reading draft blog posts too. One of these days, I'll have no projects queued up (most likely not). -I used the join-as-you-go method to join each square. 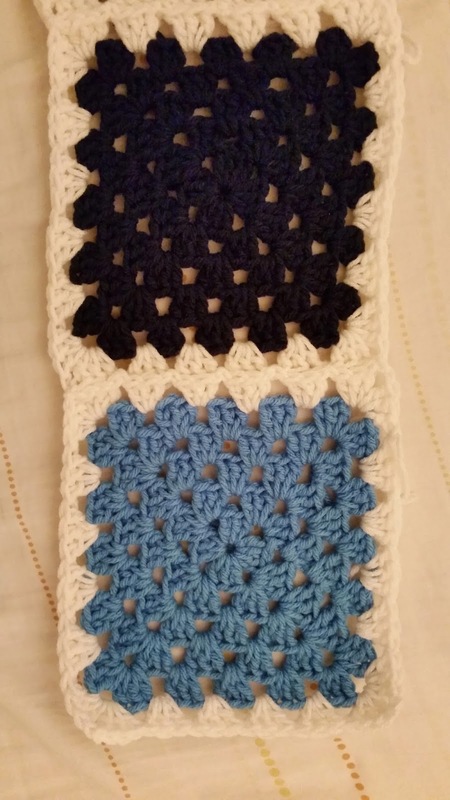 -Use the pattern below to make the squares and join in any color combination you'd like. -Ch 3 counts as a dc. 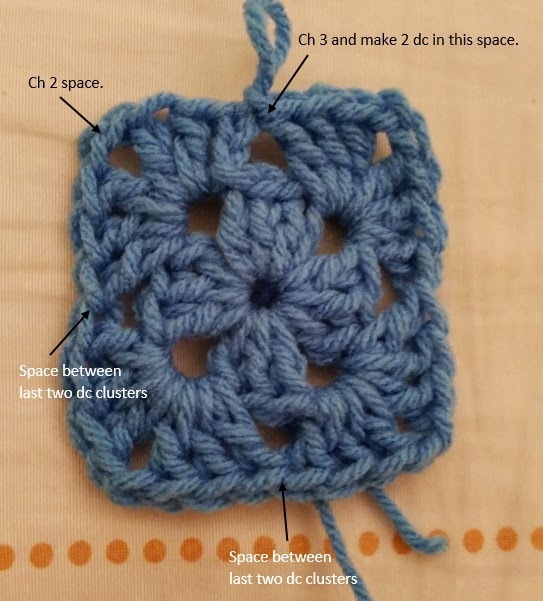 -You will be making dc clusters (see Special Stitch below) in the ch 2 spaces and in the spaces between the last dc clusters. Make a magic circle and ch 1. (3 dc, ch 2) 4 times. Join with a sl st to complete the square. Sl st in the tops of the next 2 stitches and in the ch 2 space (see picture below). Ch 3. 2 dc in the ch 2 space. Ch 2, then make a dc cluster in the same ch 2 space. (Dc cluster, ch 2, dc cluster) in the next 3 ch 2 spaces. Join with a sl st in the top of the ch 3. Ch 3. 2 dc in the space below join (see picture below). *(Dc cluster, ch 2, dc cluster) in the ch 2 space. Dc cluster in the space between the last dc clusters. * Repeat from *to* 2 times. (Dc cluster, ch 2, dc cluster) in the last ch 2 space. Join with a sl st in the top of the ch 3. Ch 3. 2 dc in the space below join. Dc cluster in the next space. *(Dc cluster, ch 2, dc cluster) in the ch 2 space. Dc cluster in the next 2 spaces. * Repeat from *to* 2 times. (Dc cluster, ch 2, dc cluster) in the last ch 2 space. Join with a sl st in the top of the ch 3. Ch 3. 2 dc in the space below join. Dc cluster in the next 2 spaces. *(Dc cluster, ch 2, dc cluster) in the ch 2 space. Dc cluster in the next 3 spaces. * Repeat from *to* 2 times. (Dc cluster, ch 2, dc cluster) in the last ch 2 space. Join with a sl st in the top of the ch 3. Note: Only perform this round for your first square. Fasten off. Join white yarn with a sl st in the ch 2 space corner. Ch 3 (see picture below). 2 dc in the ch 2 space. Ch 2, then make a dc cluster in the same ch 2 space. *Dc cluster in the next 4 spaces. (Dc cluster, ch 2, dc cluster) in the ch 2 space. * Repeat from *to* 2 times. Dc cluster in the next 4 spaces. Join with a sl st in the top of the ch 3. Fasten off. Make another square in the color of your choice, skipping Round 5. Attach white yarn with a sl st to the corner of your second square (in the ch 2 space). Ch 3. 2 dc in the ch 2 space. Ch 1, insert hook from front to back in the corner of the first square and sl st. Dc cluster in the corner of the second square. *Insert hook in next space of the first square and sl st. Dc cluster in next space of second square. * Repeat from *to* 4 times. Ch 1, insert hook from front to back in the corner of the first square and sl st. Dc cluster in the corner of the second square. *Dc cluster in the next 4 spaces. (Dc cluster, ch 2, dc cluster) in the ch 2 space. * Repeat from *to* 2 times. Dc cluster in the last 4 spaces. Join with a sl st in the top of the ch 3. Fasten off. Numbers correspond to the first and second squares in the pattern. 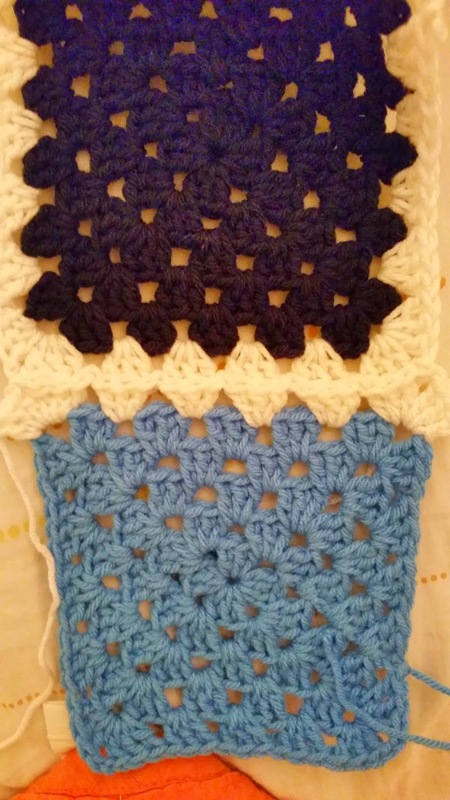 Continue making squares following the motif, skipping Round 5 each time. Only the first square needs Round 5. Join them in any color combination you'd like. 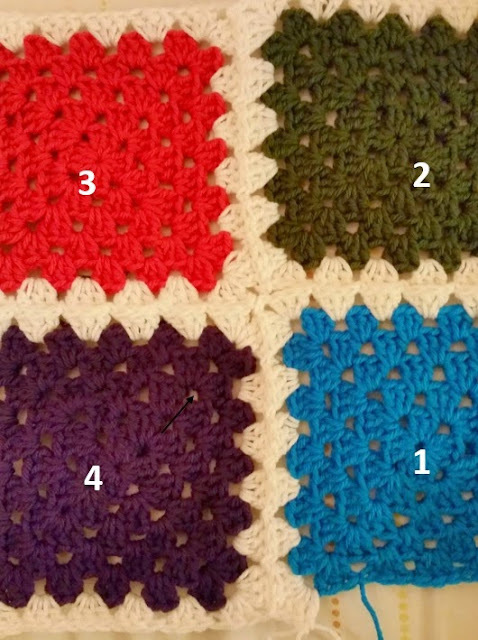 You can also choose how wide/long you would like your blanket to be by adding more or less squares. 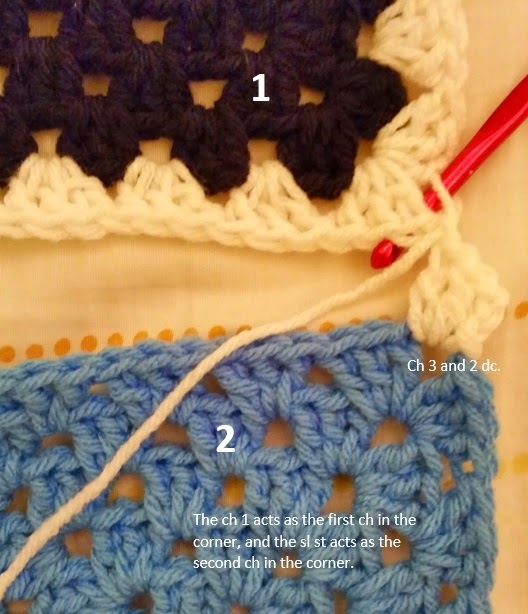 Attach white yarn with a sl st to the corner of the first square (in the ch 2 space). Ch 3. 2 dc in the ch 2 space. Ch 1, insert hook from front to back in the corner of the second square and sl st. Dc cluster in the corner of the first square. *Insert hook in next space of the second square and sl st. Dc cluster in next space of first square. * Repeat from *to* 4 times. Insert hook from front to back in the corner of the third square and sl st. Insert hook from front to back in the corner of the fourth square and sl st. Dc cluster in the corner of the first square (see pictures below). *Insert hook in next space of the fourth square and sl st. Dc cluster in next space of first square. * Repeat from *to* 4 times. Ch 1, insert hook from front to back in the corner of the fourth square and sl st. Dc cluster in the corner of the first square. Dc cluster in the next 4 spaces. (Dc cluster, ch 2, dc cluster) in the ch 2 space. Dc cluster in the last 4 spaces. Join with a sl st in the top of the ch 3. Fasten off. Numbers correspond to the first, second, third, and fourth squares in the pattern. 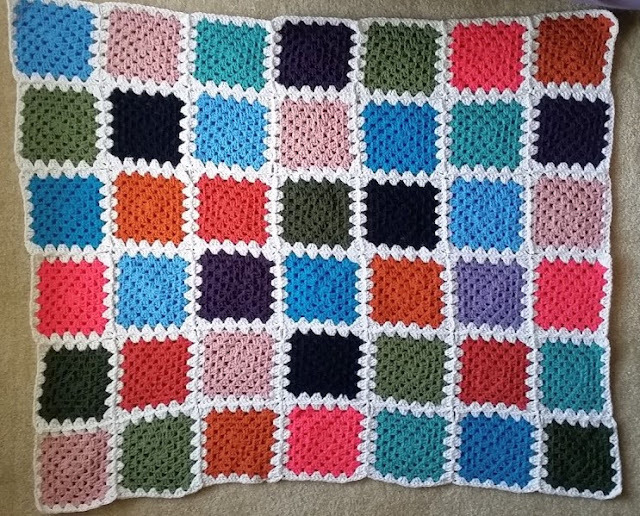 My blanket is 7 squares wide and 6 squares long (48 in wide x 41 in long). Trim/weave in all ends with the tapestry needle when finished. I worked over loose ends to avoid sewing in so many tails. I chose random colors as I went along and didn't have a set plan as to which order to put the colors in. 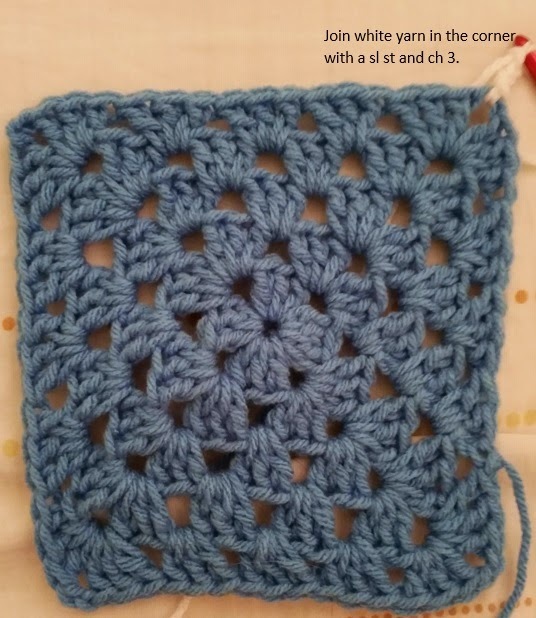 The beauty of this pattern is you can make it in any color variation you like, and even have different colors in the granny squares themselves. I hope you have fun using your imagination when making this blanket. Can't wait to see your finished products. Happy crocheting! 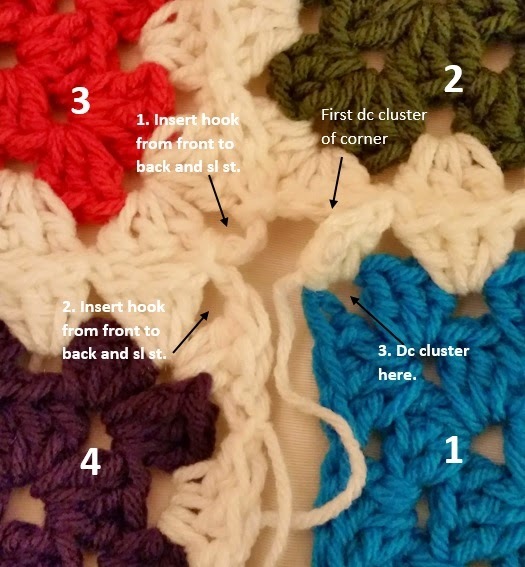 Love your pattern of the granny square blanket, but I fully understand how to do the granny sq. pattern, but when it comes to putting it tog. I need help. I would love to have mine come out like yours, me I'm just and amature, any sugestions on how to conquer my fear of putting things together. Thank you, Wanda Mucciaccio from Attleboro, Ma.